Having just joined the Smoothie Vegetarian family, I think I should start off by introducing myself a little bit. My name is Terri, and I live on a little rural Ontario hobby farm with my husband and 13-year old daughter. I crochet for charity, love horror movies, and spend a lot of time in the kitchen. Oh, and we homeschool too. We grow the majority of our produce here and are having a great time exploring more choices for seasonal whole food and plant-based recipes. When you suddenly have 3 bushel baskets of red bell peppers sitting in the kitchen, you have to get creative. So that's what we do. What makes our food journey a little more difficult is that I have Celiac disease, which means we have to avoid gluten at all costs. That means no foods with wheat, rye, barley and anything with malt flavoring. So you'll probably notice that a lot of the recipes that I post will be gluten-free as well as vegan. Not always, but most of the time. And now we come to the main point of today's post: being both vegan and gluten-free. Generally, they don't really interfere with each other. I'm already reading ingredient labels like its my job, so that's no big deal. I just have to watch for a few more things than most people. 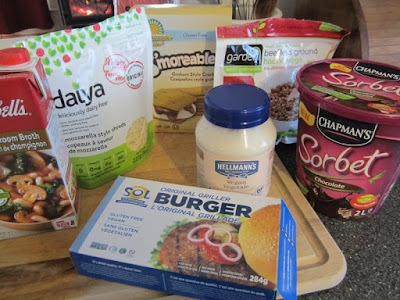 My biggest problem is finding good vegan meat substitutes that aren't based on wheat gluten. I am missing out on the glory of seitan, for example. Products from Tofurkey, Yves and Gardein are usually (but not always) out of my reach too. Ironically, many "meat" products that aren't based on wheat are often flavored with soy sauce, which has wheat in it. So I am still screwed. I'm looking at you, sesame garlic tempeh strips from Tofurky. Thankfully, the exploding markets of both gluten-free and vegan foods have given me some choices that are working out well for us. We get a lot of Sol and Daiya products, and hope the new year brings more choices to our local supermarket. Outside the world of faux meat, there is no shortage of fantastic vegan food that is also free of gluten. Our pantry is always stocked with rice pasta, lentils, chickpeas, tomato sauce, tofu, canned coconut milk, nutritional yeast, nuts, and all the usual baking staples (with rice flour being our main go-to flour). The fridge is packed with fresh veggies, fruit, mushrooms and at least one carton of almond milk. And leftovers. Lots of leftovers. It's probably for the best, if you think about it. As we get more and more plant-based in my house, we've had to do more cooking from scratch since processed products don't work very well. That just means healthier foods, and better skills in the kitchen. So if you are living with Celiac disease and trying to be vegan as well, you may be in for some challenges but it's definitely do-able. Just think of it as being gluten-free for you, and vegan for the planet. Thank you for this. My daughter is a Celiac - it's been quite the learning curve!